Nothing beats Mucinex for congestion from colds and flu. I have been sick for three days with sinus pressure, runny nose, fever, and all over aches and pains. I was taking several name brand cold and flu medicines and they helped a little but then a friend of mine brought me some Mucinex. One tablet later, I felt like Me again. It is a bit more expensive than some of the others, but you get what you pay for and it is definately worth it. I was suffering from a cold that seemed to not go away. I decided to use this product and within the week my symptoms were lessening and I started to feel much better. This product works better and faster than the products that are similar. My husband vand I got sick at the change of the season. Used a sample and had to get more! This is the only thing that is helping with our coughs! For it being a pill, not a "coating liquid" - it works amazingly well! I'd buy this over and over despite price! So worth it! This product is absolutely everything it advertises it will be. With all the cold medicines out there, it's hard to want to buy one of the more pricey products when there are medicines that claim to do the same thing for half the cost. I'm all for saving money but when it comes to congestion and all that yucky stuff, mucinex is my go to every time. I have used the diffrent kinds of Mucinex depending on my symptoms and they all worked equally well. One thing that I do recommend is to drink as much water as possible while taking this. You should take each dose with a glass of water, but the more you drink the thinner the mucus becomes and the quicker the mucinex can clear you out. I just had the worst sickness this winter and mucinex helped me to stop feeling like I couldn't breathe and I don't think I could have gotten out of bed without it. I think it saved me a trip to the emergency room for sure! Definitely give it a try for any congestion and cough, I'm sure it will work great and don't be scared of the price because it's worth every penny to stop feeling like you can't breathe. Its a valuable most everywhere now including grocery stores and pharmacies. I will never buy any other medicines for this, its all that's needed and helps immensely! Highly recommended and I personally have used it many times as well as my husband, and the children's kinds too for my kids and they all agree it's a life saver when you are clogged up and feel rotten. Used to use Great Value cold medications as well as the regular Mucinex expectorant. But more recently I have switched to this particular expectorant and cough suppression, and it is the best one I have used, and I plan to keep using it. 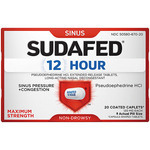 Congestion Relief This product does as good of a job on congestion relief as the regular Mucinex expectorant. Chest Congestion Relief I don't get chest congestion very often, but this Mucinex clears it up quickly when I do get it. Cough Suppression Cough suppression is the main reason I like this cold medicine better than others. When I get a cold, my throat often gets very sensitive, especially to the cold air. So it can be easy for me to start coughing and have trouble stopping, even long after the other symptoms of the cold have gone away. 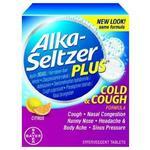 But this product helps soothe the throat and suppress the cough, nearly eliminating this cold symptom completely. Combined with the expectorant, this product helps drastically reduce the two main symptoms of colds from which I suffer. I love Mucinex. It is one of the few over the counter products that I find makes a real difference in shortening the amount of time (and overall general amount of) chest congestion. When I take Mucinex, my chest congestion goes away considerably more quickly than if I don't take it. It works quickly and I don't have any side effects that make me groggy or feel otherwise off because of taking it. Congestion Relief Mucinex is great at providing both sinus/nasal congestion and overall chest congestion. I usually feel relief within 20 minutes of taking it. Chest Congestion Relief This is one of the few prodcuts I've tried that provides pretty quick relief. I feel better shortly after taking it, and have a considerable amount of relief about a day or two after taking it. Cough Suppression This is one of the few over the counter medications that makes a dent in my nasty cough once it gets into my chest. It breaks up the congestion never fully letting it settle. But when I do have congestion, this keeps my cough at bay. I think this stuff is amazing. I could leave it at that, but I'll say more! Mucinex DM Maximum Strength expectorant and cough suppressant it probably one of my favorite products when I have a truly terrible cough that just won't go away. I'm not sure how this stuff works, but you take it and it magically loosens up whatever crud is in your lungs and allows you to clear it out, making for a less painful and congested cough. On that same note, it also manages to help with the excessive coughing, so the coughs you do have, are productive ones. My husband first turned me onto this product years ago, and I was hesitant but gave it a try when I had a really painful, congested chest cold - and surprisingly, this helped. 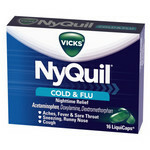 I am now convinced of the benefits of this product and will go to it the next time I have a really awful cold. Relief of Aches & Pains It doesn't necessarily relieve the aches and pains associated with a chest cold or flu, but it does alleviate the pain of a tight, congested cough. I have used this a few times when I have really bad chest congestion that just will not go away. It helps when you have a really bad cough to. When I take this medicine it helps to break up the congestion and I usually have phlegm that gets broken down and coughed up and spit out. It does help with any pain you may have in your chest as well from all of the coughing and congestion. I usually take this medicine for a few days or longer to help clear all of the congestion and coughing I have. I am very happy with this medication and would highly recommend it to anyone that has chest congestion or a bad cough that you cannot get rid of. Congestion Relief Great for congestion that won't go away after a cold or flu you may have had. Chest Congestion Relief Great chest congestion medication, especially when you have a lingering congestion that just won't go away. Relief of Aches & Pains It help relieve any pain you may have from coughing or chest congestion. Cough Suppression Works great to help relieve coughing. Mucinex DM Maximum strength expectorant and cough suppressant is by far the best medication to take when your feeling sick with congestion and cough. One thing I love about this particular product is that you can purchase it almost anywhere. I can typically purchase it from the grocery or drugstore. This makes it very convenient to purchase! I also adore how soon I feel better after taking this particular medication. I typically feel better after thirty minutes after taking this medication. The only downside of this particular medication is the cost. It is a bit more expensive than the competing brands but it is worth the extra money. It really worked for me! Congestion Relief The congestion relief is wonderful! Chest Congestion Relief This particular medication really relieves chest congestion. Relief of Aches & Pains Great for relief of aches and pains. Cough Suppression This particular medication really and truly works wonders when it comes to cough suppression. Great product if you are congested! 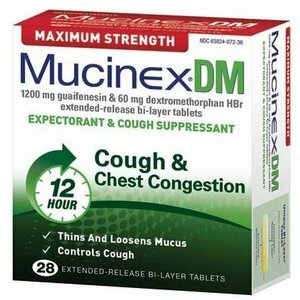 Mucinex DM Maximum Strength Expectorant & Cough Suppressant should be an essential part of your medicine cabinet if you experience significant congestion when you have a cold. There are generic forms of this product but they do not work nearly as well as the Mucinex brand. I take this product right after I realize I have come in contact with the virus. It does a fantastic job at helping to suppress my cough and to help with the significant drainage I experience while the virus is attacking my immune system. I take this product in the morning and I am able to function fairly well throughout the whole day. 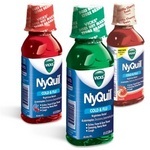 I also find that it suppresses my cough and minimizes drainage while I am sleeping. 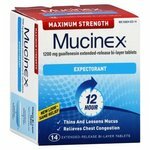 Consistent use is key with this Mucinex product. I highly recommend this product. It will make getting through cough and cold season a much easier process. It is affordable and effective!